On March 14th, 2016, The San Pedro Sun celebrates 25 years of serving the San Pedro community. The first printed publication in San Pedro was "The Village Shopper" which was started in 1981 by Linda Cornelison. 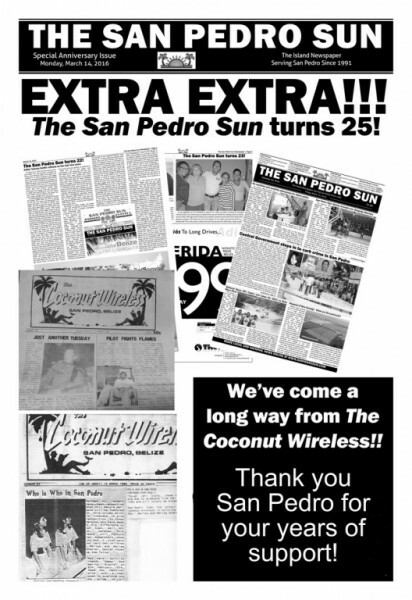 The newsletter was more about shopping (which is hard to imagine the shopping options 31 years ago in San Pedro) than news, and in 1982 the publication evolved into The Coconut Wireless, featuring a few community-based columns. The Coconut Wireless was the first paper to be sporadically published on the island and Linda Cornelison was the owner, editor and publisher. Other residents on the island, including Victoria and Bruce Collins (deceased), and Woody Canaday worked with Cornelison to put out the first issue. When Cornelison had to be away, the Collinses and Canaday kept the Wireless going, putting 13 issues out and bringing the newspaper out of debt! In November of 1990, Cornelison returned and took over the publication once again; but plagued with personal issues, she eventually ran into legal problems, was incarcerated for some time (talk about headline news! ), and The Wireless eventually failed to exist. In the meantime, Bruce and Victoria had been in the stages of preparing their own newspaper, and after the inevitable demise of the Coconut Wireless, went into full print mode. On March 14, 1991 the first issue of The San Pedro Sun was printed. Their first office was inside Fido’s Courtyard, and prepared using a Brother word processor…until the first computer was purchased from Jeanette Salfeety. The paper went cyber in July 1996 when it started a website page on the popular www.ambergriscaye.com website. In 1996, the newspaper was sold to Dan and Eileen Jamison, who moved the paper process to their home upstairs of what is now Saga Humane Society’s current location. After running the paper for seven years and thoroughly enjoying the opportunity to work with the San Pedro community, they sold the paper to Ron and Tamara Sniffin in September 2004. The Jamison are now the owners of the super delicious "DandE's Frozen Custard" on Pescador Drive. For the Sniffins, the growth of The San Pedro Sun has been amazing. From a staff of one to now five, a circulation that has more than quadrupled, a Visitor Guide that began in 2005 and evolved to a monthly magazine in 2013 as My Beautiful Belize, to two popular websites that receive heavy traffic, and a multitude of plans for the future, editor Tamara Sniffin is thrilled with the progress. "Whew, it's been a very busy 11 plus years, but now it is time to reflect and say I think we've done well!" Tamara also credits the staff of The San Pedro Sun for much of their success. "Our staff is tremendously talented, hardworking and dedicated. Mary has been with us since 2005, Janelle has worked for us since 2012 (and has transitioned to part-time), Dion has been with us for close to a year and we are so thrilled to welcome two new members: Noel and Chelsea. Noel has already integrated himself well into his office manager role, while Chelsea brings a fresh new perspective to our news stories. We couldn't be prouder of our staff or our paper." Of course, The San Pedro Sun has the community to thank as well for their years of success and they are proud to be the voice of the people. We look forward to a long and prosperous future and embrace all of those who have helped us along our way as we have grown into what we are today. Thank you all!